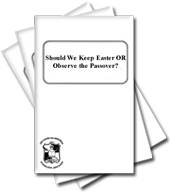 Should We Keep Easter OR Observe the Passover? Faith is the sure knowledge that God exists and that He will accomplish those things He has promised. Faith in God-trust in His promises and belief that He is in overall control is a major element in the Christian life and is absolutely necessary for salvation. "...the just shall live by his faith." These words were first uttered by the prophet Habakkuk and quoted three times by the apostle Paul. Living faith is at the heart of true Christianity. It is absolutely essential for salvation (I Pet. 1:5-9). Christ described faith as a weightier matter of the law (Mt. 23:23). Paul listed it among the three greatest Christian virtues (along with hope and love). Without faith it is impossible to please God (Heb. 11:6). Far from being simply a feeling in his heart, the Christian's faith motivates his entire pattern of living. Faith functions as the fulcrum of true Christian thought and behavior. The two distinct meanings of the word "faith" are found in the English translation. When preceded by the definite article ("the faith") it means the overall system of doctrine and belief accepted by the Church, and by extension, the Church itself (Acts 6:7; 13:8, 14:22). When used without the article it means "the substance of things hoped for, the evidence of things not seen" (Heb. 11:1) which is perhaps the clearest biblical definition of faith. Faith is thus an absolute belief that God exists and a total trust in His statements (Heb. 11:6). Ultimately, faith deals with God's promises-with the future. It is the trust in "things not seen." Of course, belief cannot be blind. It must be built on genuine conviction. It has to come from perceiving God's hand in creation, His work in history and the experience of His fulfilled promises in one's own life. This is the foundation of faith. But one does not need faith in what has already been accomplished. Faith, therefore, is the willingness to believe God will not fail even though He has not actually brought about what is promised (Heb. 11:1). True faith must come from God and has many facets, though the primary ones relate directly to Jesus Christ. Faith in its simplest but most profound manifestation is a deep personal belief in Jesus Christ; in the fact that He is our Savior; in the truth that His death paid the individual penalty of our personal sins. Faith is the full confidence in the message Jesus brought. This faith in Christ is the belief that leads us to baptism. (Baptism is merely an outward symbolic testimony that we have inward faith in Christ.) Paul speaks of this faith in Galatians 2:16 when he remarks we "have believed in Jesus Christ, that we might be justified by the faith of Christ." After baptism, one receives God's Holy Spirit through the laying on of hands. At this point Christ, through the Spirit, lives in us and empowers us with a growing and internalized godly faith. Since faith is not self-generated, but is rather the faith of Christ's Spirit in us, it is termed the "faith of Christ" (subjective genitive). It is this faith of Christ that we must express and live by in every facet of life. But faith is not an end in itself. It is rather the vehicle by which we may obtain salvation. Of course, salvation can in no way be earned, either by obedience or faith, for nothing man can do would obligate God to grant salvation had He not decided to give man this gift of His own volition (according to certain terms). But God nevertheless has obligated Himself to grant salvation if one has living faith. God says the presence of this faith is counted in His eyes as righteousness and indeed justifies us before God (Rom. 4: 1-7). Faith is the motivator which causes us to live a godly life. From this it follows that one who has real belief in God and hopes in His promises will demonstrate this fidelity by his actions, by his obedience. Indeed, "whatsoever is not of faith is sin" (Rom. 14:23). The true Christian will obey God and do good works, for "faith without works is dead" (Jas. 2:20). Our good works do not save us, but they do demonstrate faith. James wrote, "I will show you my faith by my works" (Jas. 2:18), directly contradicting the notion that faith can maintain an exclusively mental / spiritual existence devoid of any physical action and behavior. One who does not obey God is said to possess "dead" faith, a trait no better than that of the demons who themselves believe God exists but refuse to obey Him (Jas. 2:19). To have real faith, does not mean that one will never doubt. Doubt is a normal human characteristic and emotion, and even the truly begotten Christian is not immune from it. Yet one must contest doubt, not by deluding oneself but by rehearsing reality. One should return to the fundamentals of biblical belief, to one's first love, by thinking the thoughts and doing the works he did when he was first being converted. Doubt need not undermine faith, but true faith can surmount doubt. God commands that "the just shall live by faith" in every facet and area of his life. One must fully live by faith, because God has made promises which affect virtually every part of man's existence. He has promised to help us in trials if we are faithful and to answer every prayer that is prayed according to His will and in faith. These expressions of faith are again not ends in themselves. In fact they are secondary as compared to a Christian's main thrust of faith which is belief in God's promise of the resurrection from the dead and in salvation. Other areas of faith are important only as they contribute to our faith in the resurrection. Paul says one who does not earnestly hope for the resurrection has "faith in vain" (I Cor. 15:14), because one who has no hope of being resurrected from the dead has no hope at all! It is a Christian's faith in the resurrection from the dead which lies behind all his earthly actions. It is this faith and hope which encourages him to press onward toward salvation in spite of trials and disappointments. God's ultimate design is to bring every human being from the human level to the divine level-from flesh to spirit-from a temporary physical existence to an eternal spiritual existence. This is the foremost frontier of faith. It involves development of character, which includes the trials and experiences of human life. God's promises for the "good life" on the physical level are subordinated to His ultimate purpose of fulfilling His main promise on the spiritual level. A Christian who is living by faith realizes physical promises may be delayed for his spiritual benefit, but he knows that his life is absolutely in God's hands no matter what. Some by their faith have been delivered, while others by the same faith have been martyred (Heb. 11) or allowed to die without seeing the ultimate fruit of their endeavors in this life. The faith of Christ in us is one of the fruits of God's Spirit mentioned in Galatians 5:22. As such it cannot be "worked up" and is in no other way self-generated. It should never be static but must be constantly growing and expanding in every aspect and area of life. This faith may be built and grow in different ways, through experience, through trials (Rom. 5:1-5), by reading the inspired Word of God (Rom. 10:17), through the interaction with the faith of others, etc. Faith must be constant, unfeigned, based upon true promises, without time limit and always growing. The Bible illustrates the faith of the patriarchs and men of God throughout history as an example and encouragement to us. We are told of Abraham, the father of the faithful. We are reminded of Enoch, Elijah, Samson, Jephthah, David and the prophets. We see the awesome example of Jesus Christ Himself, who gave up His exalted position as God, emptied Himself into human form and was sacrificed in faith, so that He could become the Savior of mankind after the Father would resurrect Him. Likewise, we look at the examples of the apostles and of fellow brethren who were martyred for the sake of Christ. Finally, we learn that God will grant these faithful men salvation and eternal life in God's kingdom, because they believed they would receive it, and because they had real faith. They will receive the reward they hoped for, because they believed that God existed and that He was the rewarder of those who diligently seek Him (Heb. 11:6). Our task is to follow their example and receive this same reward. 1 Peter 1:5-9-Faith required for salvation. Matthew 23:23-Faith is the weightier matter of the Law. Hebrews 11:1-Faith is the substance of things hoped for and the evidence of things not seen. Galatians 2:16-Man is justified by faith in Jesus Christ. Romans 4:1-7-Faith in us is counted as righteousness and justifies us before God. Romans 14:23-Whatsoever is not of faith is sin. James 2:20-Faith without works is dead. James 2:18-Show me your faith without works and I will show you my faith by my works. 1 Corinthians 15:14-We must believe in the resurrection of Christ or our faith is vain. Galatians 5:22-Faith is a fruit of the Spirit. Romans 5:1-5-Justified by faith, we have peace. Romans 10:17-Faith cometh by hearing and hearing by the Word of God. c) Hebrews 11:6 6) Having faith is a feeling of the heart. True or False? 7) "faith" and "the faith" mean the same thing. True or False? b) the substance of things hoped for, the evidence of things not seen. 10) Faith is a willingness to believe God will not fail even though He has not actually brought about what is promised. True or False? f) items a, b and c.
13) Baptism is an outward symbolic testimony that we have inward faith in Christ. True or False? 15) Once we are baptized and we receive the Holy Spirit we learn how to self-generate godly faith. True or False? 16) The faith in us is possible by the power of God's Spirit and is actually the faith of Christ's spirit in us. True or False? 19) A true Christian will obey God and do good works. True or False? 22) Faith is exclusively a mental and spiritual element of the Salvation Process devoid of physical action. True or False? d) to believe that God exists. 25) God's ultimate design is to bring every human being from flesh to spirit. True or False? 26) A Christian who is living by faith realizes physical promises may be delayed for his or her spiritual benefit. True or False? 28) As Christians we know that true faith is a sincere feeling in our hearts and we have the power to let it give us an emotional, mental high. True or False?